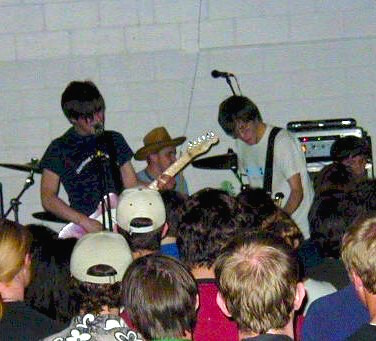 Desaparecidos’ 2001 stage debut at the Holy Name High School fieldhouse. The feature on Desaparecidos in The Reader is on newsstands now and online right here. Denver Dalley (and I) recall the origin of the band, starting in 2000. He talks about its rise, its unannounced hiatus, its return and the band’s new album, Payola. Better go read it. The interview was conducted in support of the band’s concert this Thursday, Sept. 10, at The Waiting Room, which, rumor has it, is close to selling out. And as Dalley says in the story, if you’re on the fence about seeing them this time ’round, “There’s a chance there won’t be a next time.” Better get your tickets now. I concluded the interview with Denver the way I’ve concluded all the Desa interviews I’ve had with Denver, with this question: When will Team Rigge return? Named after a building on Creighton’s campus — Dalley said hip-hop act Team Rigge has included Ian McElroy, The Faint’s Clark Baechle, Oberst, former Cursive drummer Clint Schnase, Son Ambulance’s Joe Knapp and Dan Maxwell of Little Brazil, who at the time was a member of Secret Behind Sunday. Still, Dalley said he’d “be curious” to see a reunion of surviving members. “I’d also love to see a Smashmouth reunion,” he said, referencing a band that included Criteria’s Pedersen, bassist Bart Volkmer and drummer Schnase. Denver said during Desa practices he’ll start to play a Commander Venus song and guitarist Landon Hedges will immediately join in, “but it just fades off. Maybe that will be my ultimate goal — to break him down before Sept. 10 to do one encore song.” Do you think CV guitarist Robb Nansel would join them on stage? Twin Shadow returns to The Waiting Room tonight. Twin Shadow is Dominican-born George Lewis, Jr., whose 2012 album Confess (4AD) was a dizzying trip back to ’80s electro-pop with a sound that recalled everything from General Public to Fine Young Cannibals to New Order. I caught the band this year at SXSW, where they played music from their current release, Eclipse, which isn’t much of a departure from Confess. Opening is electronic trio LANY. $17, 9 p.m.
Also tonight, Seattle band La Luz headlines at fabulous O’Leaver’s (where I’m told the new beer garden has finally opened (and must be seen to be believed)). Opening is Will Sprott and the always entertaining Sucettes. $7, 9 p.m.